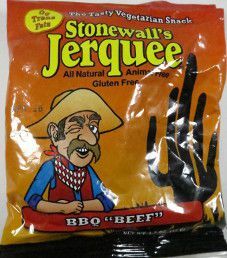 This next review on the Stonewall’s Jerquee brand of jerky will be on a 1.5 ounce/42 gram bag of their BBQ “Beef” flavored vegan jerky. This jerky is actually not vegan certified, but is unclear as to why. 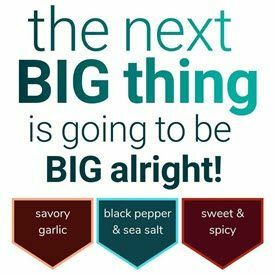 The bag was purchased at a Heritage Natural Market store in Virginia Beach, Virginia. 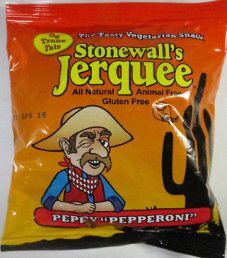 This first review on the Stonewall’s Jerquee brand of jerky will be on a 1.5 ounce/42 gram bag of their Peppy “Pepperoni” flavored vegan jerky. This bag was purchased at a Heritage Natural Market store in Virginia Beach, Virginia, back in August 2015.